Could Dapchi Girls Hurt APC’s Re-Election Chances? Nigerians received good news this week with the release of approximately 101 girls who were kidnapped by Boko Haram on 19 February this year, taken from a government-run boarding school in Dapchi, Yobe State. President Muhammadu Buhari’s administration seemed determined to avoid the predicament his predecessor faced in 2014, when Boko Haram kidnapped 276 girls from a school in Chibok just months ahead of a presidential elections. That incident triggered one of the largest social media storms in history, making #BringBackOurGirls one of the biggest hashtags ever on Twitter. Within two weeks #BringBackOurGirls had been tweeted over two million times. So when the “Dapchi girls” were taken, there was a sense of déjà vu as well as palpable political panic for Buhari’s party as it heads into presidential election, slated for early 2019. This post draws upon research I conducted for my new book, Nigerian Party Competition in a Time of Transition and Terror, forthcoming later in 2018 from Cambridge University Press. My content analysis of political rhetoric used by officials from the People’s Democratic Party and the (then) opposition All Progressives Congress shows that insecurity did not top the list of campaign themes in the 2015 presidential election. Consistent with some existing research on terrorism in democracies (see for example Marcus, Neuman and MacKuen 2000), voters had a heightened sense of general political awareness and engagement. Nigerians ultimately cast their lot with the party that offered a persuasive portfolio of issues that included the economy, corruption, and what I categorize as “electoral integrity.” In effect, #BringBackOurGirls mattered – not just for how citizens thought about insecurity but for how they evaluated several types of policy performance. In the months that followed the Chibok kidnappings, a series of communications blunders by President Jonathan damaged his administration’s credibility. First, the military said they had rescued the Chibok girls in April 2014, infuriating the girls’ parents (See Ameh, John, Jude Owuamanam, and Kayode Idowu. 2014. “Military Lied about Schoolchildren Rescue – Principal, Parents.” Punch, April 18). The military also provided different numbers of those kidnapped, contributing to confusion and conspiracy theories about how the administration might benefit from the kidnapping. 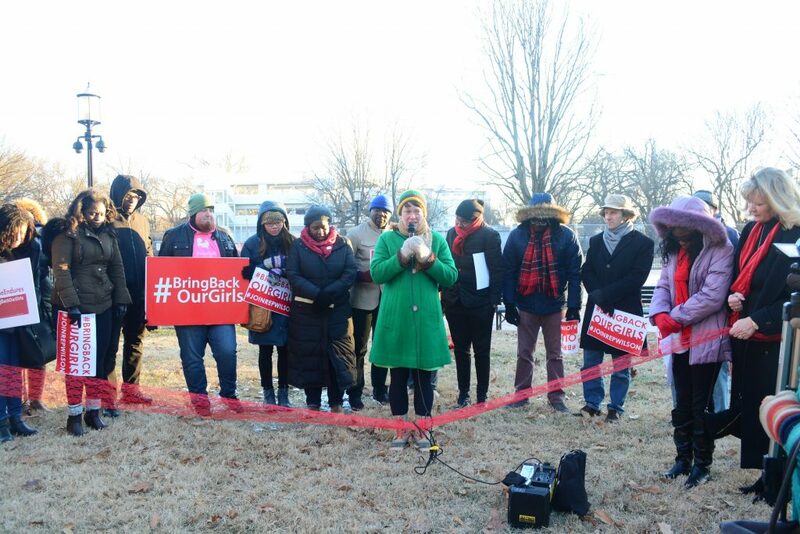 A #BringBackOurGirls vigil at the White House in January 2017 for the Chibok girls. Kidnapped in 2014, approximately 100 of them remain prisoners of Boko Haram in northeastern Nigeria. It was a very cold day (I’m on the right). The second communications blunder unfolded a month later when the Chief of Defence Staff said that the government knew where the girls were. This was untrue, and briefly intensified public frustration and demands for a rescue operation or additional military action (See Jones, Barbara. 2014. “Hostage Schoolgirl Exclusive.” Daily Mail, May 31). General Chris Olukolade made a similar stumble later that year in September, when he declared that some of the girls were safe in a military barracks – but then retracted that statement (See “Army Backtracks on Schoolgirls’ Release.” 2014. BBC, September 23). As international attention hit its peak, President Jonathan was filmed dancing at a wedding celebrating, creating the impression of detachment or apathy. Third, as the #BringBackOurGirls movement held peaceful vigils around Abuja, the police commissioner for the Federal Capital Territory banned the gatherings. “I cannot fold my hands and watch this lawlessness,” he declared. The immediate embarrassment and scandal prompted a swift retraction by police leadership (Nnochiri, Ikechukwu, Emmanuel Elebeke, and Abdulwahab Abdulah. 2014. “Chibok Girls – We Didn’t Ban Rallies in Abuja – IG.” Vanguard, June 4). Fourth, some military officials told newspapers that ten generals and other military officers had been convicted by court-martial for providing arms to Boko Haram. (What happened in these cases remains unclear to me.) A Ministry of Defence spokesperson immediately disputed those reports, according to the Associated Press. A fifth public relations blunder unfolded in July, when President Jonathan refused to meet with some parents who wanted to be accompanied by #BringBackOurGirls leaders, who had paid the parents’ way from Chibok for the meeting. In the final year of President Jonathan’s tenure, the decline of security in the northeast and his administration’s mishandling of the Chibok girls weakened the PDP’s case for successful counter-terrorism. This “credibility gap” just before the 2015 elections increased voter skepticism about the incumbent party’s ability to run fair elections, and most importantly, according to the evidence I present in Nigerian Party Competition, to deliver on the economy. There are a few similarities today with Buhari’s predicament. Shortly before the release of the Dapchi victims, for example, Bring Back Our Girls complained about “the troubling sparseness of information” from the federal government about the Yobe State girls. Several Dapchi children remain unaccounted for, and the government’s communications strategy remains uncoordinated. Notably, the number of those released has fluctuated with the government first mentioning 76 girls, and quickly revising this upwards to 101. Worse, the Nigerian military may have failed to act on information that Boko Haram was moving toward Dapchi, resembling comments from government sources who told me that Boko Haram ran amok in Chibok for several hours before the Army arrived. “The authorities appear to have learned nothing from the abduction of 276 schoolgirls in Chibok,” said Amnesty International’s investigators of the Dapchi incident. Buhari has on several occasions claimed that Boko Haram was defeated, so the Dapchi kidnapping widened the credibility gap with the public. As in 2015, citizens might treat campaign claims about economic growth or other issues with the same skepticism they now view the Buhari administration’s progress against Boko Haram. And if the administration paid the group money in return for the girls’ release, it is only a matter of time until the extortionists strike again. This entry was posted in . on March 21, 2018 by Dr. Carl.